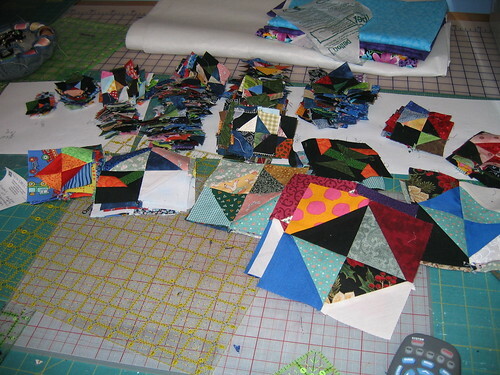 After several days of sewing, pressing, trimming, sewing and pressing some more I have 251 broken dish blocks. That equates to 2008 individual triangles! I keep checking out the window for the guys in the white jackets! I just dug through my basket of random blocks and found several more broken dish blocks along with a few more triangles and I now have 296 blocks equaling 2368 triangles! Now how do I put them all together? That's a dilemma!